Transparency Market Research, a U.S.-based market intelligence and research firm, recently published a report titled “Catalyst Market - Global Industry Size, Share, Growth, Trends and Forecast 2012 - 2018”. According to the report the demand for catalysts in the global market stood at US$19.2 billion and is expected to reach US$24.1 billion by 2018, growing at a robust CAGR of 3.9% between 2012 and 2018. The analytical and insightful market research report on the global catalyst market provides a detailed value chain analysis, Porter’s five forces analysis, and SWOT analysis to identify the key segments and the growth of this market in the forecasted period, along with a profiling of the major players in the market. The change in the rate of a chemical reaction due to inclusion of an external factor is termed as catalysis. The substances which bring about this change are called catalysts of a chemical reaction. They are a unique part of a chemical reaction, as they themselves do not participate or get consumed in the reaction like the reagents themselves, but only alter the rate of the reaction. There are various types of catalysts such as ones that speed up certain processes and the ones that slow down reactions. The catalysts which speed up chemical reactions are known as positive catalysts and the ones that bring down the pace are called as inhibitors. The global catalysts market is segmented on the basis of type, material, application, nature of market, and geography. The type segments of the global catalyst market include heterogeneous catalysts and homogenous catalysts. On the basis of materials the global catalyst market is further fragmented into zeolites, chemical compounds, metals, and others. The application segment includes petroleum refinery, polymer, environmental, and chemical synthesis. The market types for the global refinery market include off-site and on-site. Geographically, the global catalyst market is divided into Europe, North America, Asia Pacific, and Rest of the World. Out of these segments, environmental application is the rapidly growing segment in the global catalysts market. In the forecast period, it is expected to play a crucial role in raising revenue standards. As manufacturers are looking at ways to launch innovative products with thorough research and development activities in the field of environmental catalysts, this segment is expected to reach new heights in the coming few years. 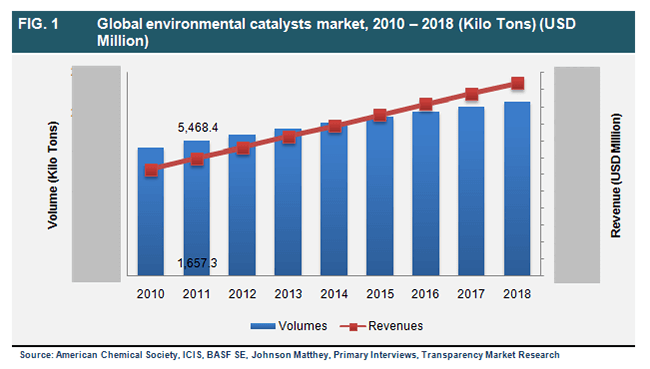 The growth in the global catalyst market can also be attributed to end-user industries such as chemical synthesis, petroleum refineries, and polymer manufacturing. The key players in the global catalyst market are W R Grace, BASF SE, Albemarle Corporation, Johnson Matthey, Honeywell (UOP LLC), and Haldor Topsoe.